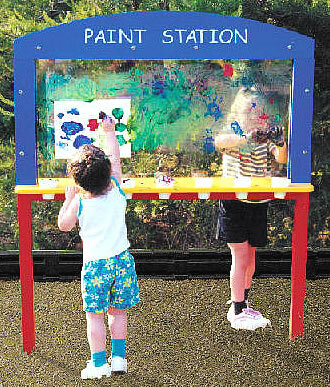 This playground paint station gives your budding artists a fun place to create their magic. There’s plenty of clearance for wheelchairs. The paint station is double-sided, to accommodate twice the number of kids. The paint shelf is designed to accept standard, reusable paint cups. The structure is made from high-density polycarbonate, so it won’t rust or split. It also cleans easily. Actual Size: 12″ x 48″. Use Zone: 13′ x 16′. Weight: 86 lbs. Kids can create works of beauty on both sides of the Paint Station!